The fastest growing sports organization in the world, the Ultimate Fighting Championship started in 1993 as a professional mixed martial arts organization. 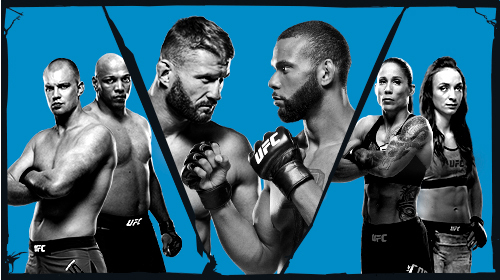 The UFC has revolutionized the fight business, and today stands as the world's leading MMA promoter, offering the premier series of MMA sports events that have sold out some of the biggest arenas and stadiums across the globe. 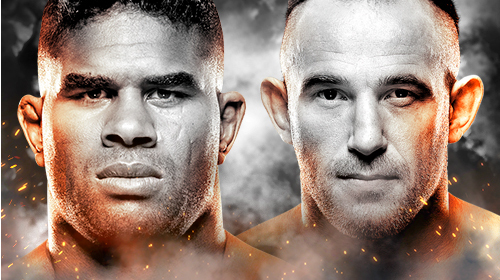 UFC Fight Night Overeem vs Oleinik Apr 20, 2019 (2:37:01) The UFC is headed to Saint Petersburg for the first time and the card is headlined by a heavyweight bout between Alexey Oleynik and Alistair Overeem. 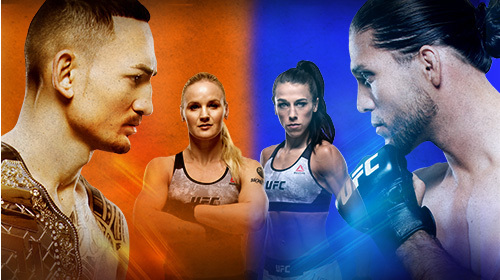 International Replay - UFC 236: Holloway vs Poirier 2 Apr 13, 2019 (0:00) UFC Featherweight Champion Max Holloway meets Dustin Poirier for the interim lightweight championship in the main event at UFC 236. 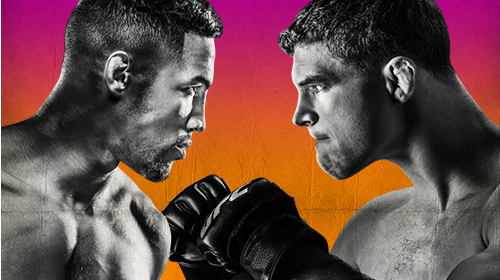 UFC Fight Night Barboza vs Gaethje Mar 30, 2019 (3:01:03) A lightweight bout between Edson Barboza and Justin Gaethje headlines the UFC's return to Philadelphia. 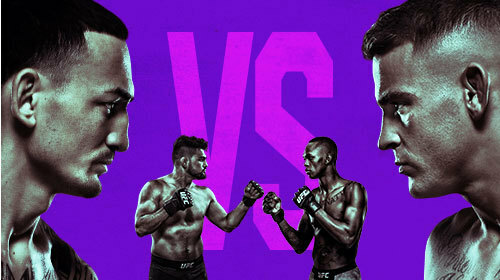 UFC Fight Night Thompson vs Pettis Mar 23, 2019 (3:07:08) A welterweight bout between former title challenger Stephen Thompson and former UFC Lightweight Champion Anthony Pettis headlines the card in Nashville. 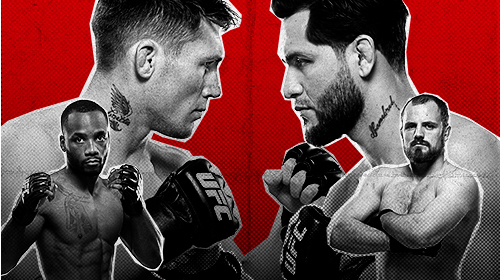 UFC Fight Night Till vs Masvidal Mar 16, 2019 (3:10:13) A welterweight bout between former title challenger Darren Till and Jorge Masvidal headlines the UFC's return to London. 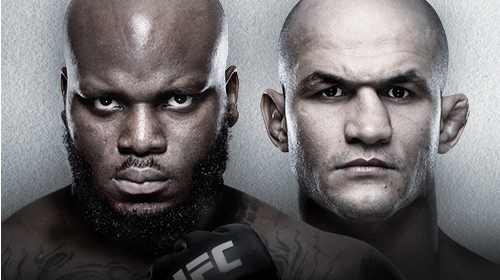 UFC Fight Night Lewis vs Dos Santos Mar 9, 2019 (2:43:00) A heavyweight showdown is set for the main event in Wichita as Derrick Lewis Takes on Junior Dos Santos. International Replay - UFC 235: Jones vs Smith Mar 4, 2019 (0:00) An incredibly stacked card is on tap in Las Vegas for UFC 235! In the main event, Jon Jones puts his light heavyweight title on the line against Anthony Smith. 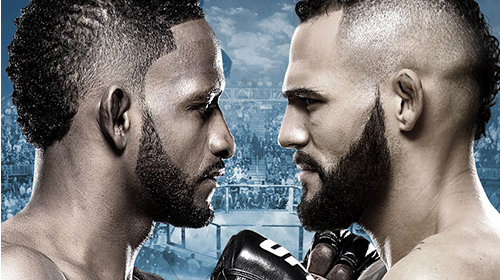 UFC Fight Night Blachowicz vs Santos Feb 23, 2019 (2:57:55) The UFC makes the trip to Prague for the first time as Jan Blachowicz and Thiago Santos square off in the main event with Stefan Struve and Marcos Rogerio de Lima clash in the co-main event. UFC Fight Night Ngannou vs Velasquez Feb 17, 2019 (2:55:48) A heavyweight showdown is set for the main event in Phoenix as Francis Ngannou meets Cain Velasquez. 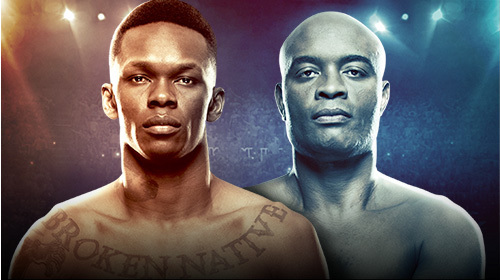 International Replay - UFC 234: Adesanya vs Silva Feb 12, 2019 (0:00) UFC 234 has become the hottest ticket in Melbourne this summer, with all tickets to the historic event selling in minutes. 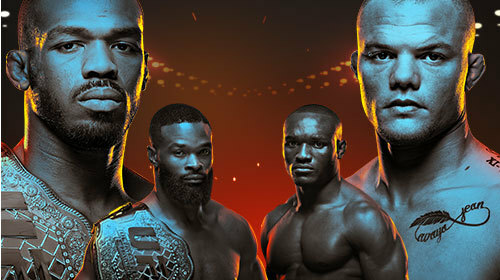 UFC 234 Adesanya vs Silva Feb 9, 2019 (2:40:15) UFC 234 has become the hottest ticket in Melbourne this summer, with all tickets to the historic event selling in minutes. 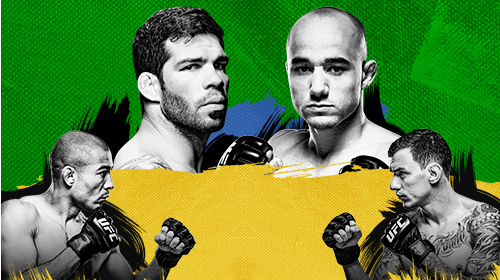 UFC Fight Night Assuncao vs Moraes 2 Feb 2, 2019 (2:31:23) A bantamweight showdown is set for the main event as top contenders Raphael Assuncao and Marlon Moraes clash. UFC Fight Night Cejudo vs Dillashaw Jan 19, 2019 (2:30:00) The flyweight title is on the line in the main event as champion Henry Cejudo looks to defend his belt against the current bantamweight champ, TJ Dillashaw. Cejudo vs Dillashaw Prelims Jan 19, 2019 (2:00:47) Check out the Late Prelims LIVE from Brooklyn. Cejudo vs Dillashaw Early Prelims Jan 19, 2019 (1:59:59) Check out the Early Prelims LIVE from Brooklyn. 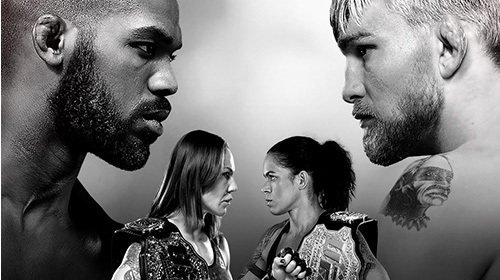 International Replay - UFC 232: Jones vs Gustafsson 2 Jan 1, 2019 (0:00) In a rematch of the greatest light heavyweight championship bout in UFC history, former titleholder Jon Jones will run it back against No.1 contender Alexander Gustafsson. UFC 232 Prelims Dec 29, 2018 (1:59:55) Before the main card gets underway at UFC 232, check out four great bouts on the Late Prelims. UFC Fight Night Lee vs Iaquinta 2 Dec 15, 2018 (2:33:03) Two of the most exciting lightweights in the world meet in the main event as Kevin Lee clashes with Al Iaquinta. UFC 231 Holloway vs Ortega Dec 8, 2018 (3:18:20) The featherweight title is on the line as Max Holloway puts the belt on the line against #1 contender Brian Ortega. In the co-main event, Valentina Shevchenko takes on Joanna Jedrzejczyk for the flyweight championship. UFC 231 Exclusive FIGHT PASS Prelims Dec 8, 2018 (1:44:48) UFC 231 starts right here on FIGHT PASS with a great lineup of bouts. Brad Katona meets Matthew Lopez in the Featured Bout. 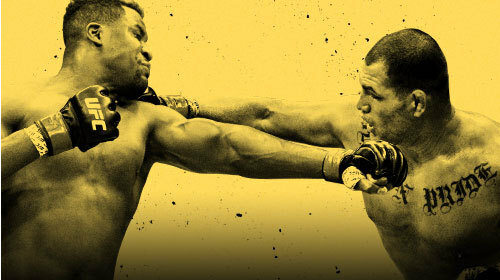 UFC Fight Night Dos Santos vs Tuivasa Dec 1, 2018 (3:04:16) Former UFC Heavyweight Champion, Junior Dos Santos, takes on 25-year-old undefeated up and comer Tai Tuivasa who fights to land in the top ten. In the co-main event, veteran Mark Hunt eyes a win in his neighboring country against the surging Justin Willis. 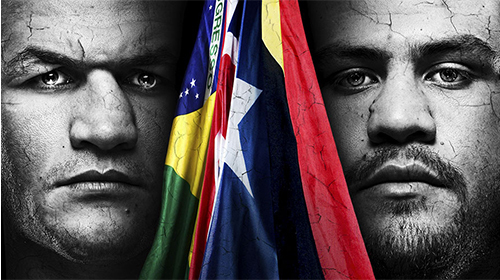 Dos Santos v Tuivasa Exclusive FIGHT PASS Prelims Dec 1, 2018 (59:30) The UFC is headed to Adelaide and the action starts right here on UFC FIGHT PASS. 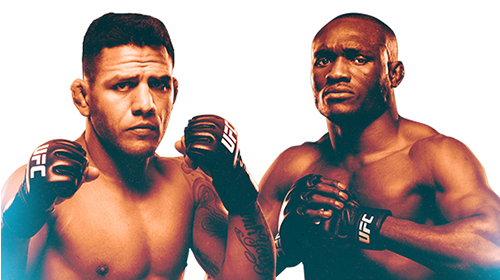 TUF 28 Finale The Ultimate Fighter: Heavy Hitters Nov 30, 2018 (3:06:45) The Ultimate Fighter: Heavy Hitters Finale will crown two new winners and feature a main event showdown between Rafael Dos Anjos and Kamaru Usman. 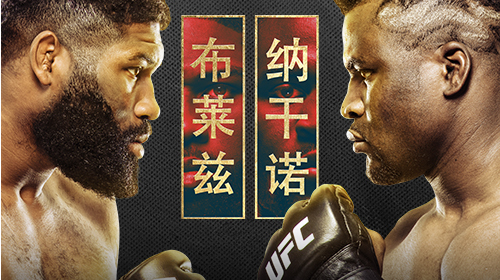 UFC Fight Night Blaydes vs Ngannou 2 Nov 24, 2018 (1:55:09) Beijing will be home to two heavyweight matchups as 11-1 Curtis Blaydes takes on 11-3 Francis Ngannou in the main event. Before the main event, be sure to catch the 23-year-old hometown kid Yaozong Hu take on 8-4 Rashad Coulter. Blaydes vs Ngannou 2 Exclusive FIGHT PASS Prelims Nov 24, 2018 (3:14:30) The UFC is headed to Beijing and the actions starts on the Exclusive FIGHT PASS Prelims. UFC Fight Night Magny vs Ponzinibbio Nov 17, 2018 (3:05:20) Two top 10 welterweights collide in the main event as Neil Magny meets Santiago Ponzinibbio. 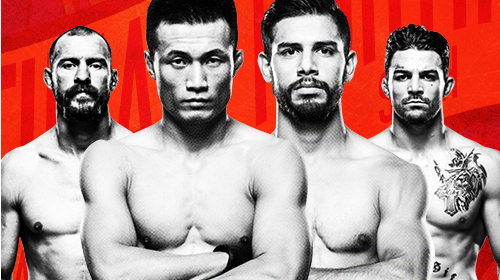 UFC Fight Night The Korean Zombie vs Rodriguez Nov 10, 2018 (3:27:16) Two fantastic featherweights meet in the main event in Denver as Chan Sung Jung takes on Yair Rodriguez.